TOEFL Independent Writing Strategies: Decode the writing task. TOEFL independent writing strategies: Engage briefly in pre-writing activities. TOEFL independent writing strategies: Write a specific three-point thesis. Example thesis statements for the agree/disagree TOEFL independent writing task. TOEFL independent writing strategies: Write 100 word introductory paragraph. Avoid overusing any one of the four sentence types. Use different types of subjects. TOEFL Independent Writing Strategies: Practice makes perfect, right? The most important TOEFL independent writing strategies involve your ability to break the writing task into parts so that you can understand how to organize your essay. You MUST understand what you are being asked to do before you do it. It is generally agreed that society benefits from the work of its members. Compare the contributions of artists to society with the contributions of scientists to society. Which type of contribution do you think is valued more by society? Give specific reasons to support your answer. Notice in the above response how the student focuses on why scientists are more valued in society. He should have compared the contributions of artists to scientists in paragraphs 2-3. Finally, the last paragraph is where he should have framed his argument. 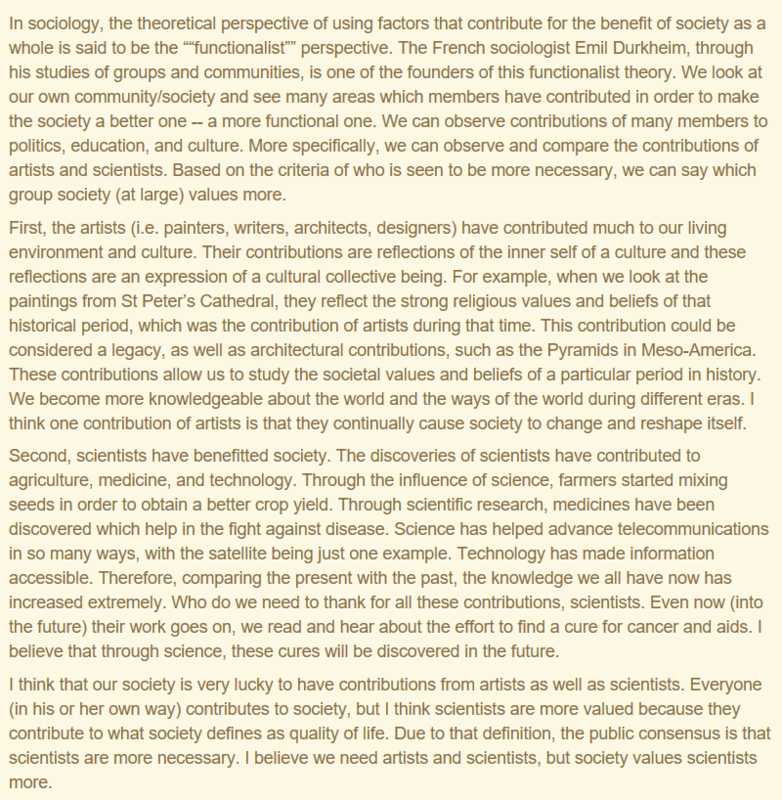 On the other hand, notice how the below essay is more closely framed around the writing prompt by 1) explaining the contributions of artists, 2) mentioning the contributions of scientists, and 3) arguing that both contribute positively to society. In all likelihood, you will see three different kinds of writing prompts: agree or disagree, explain both sides, or make an argument from multiple sides. 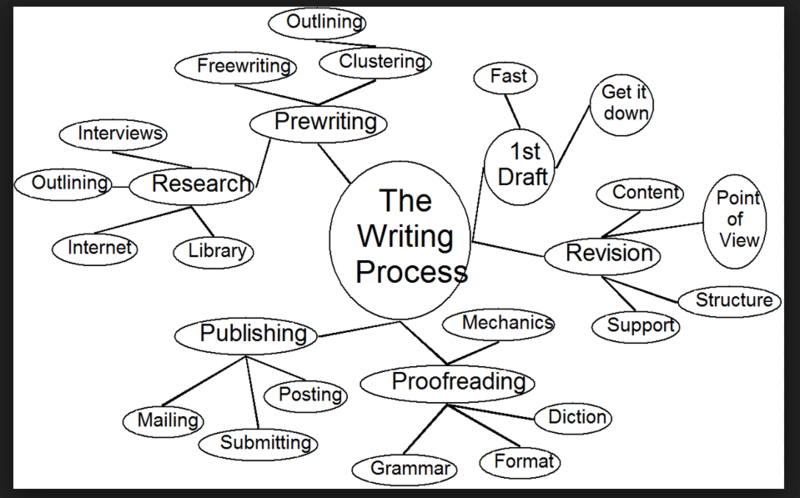 To see 100 writing prompts in these categories, go here. To apply effective TOEFL independent writing strategies, you need to understand how to organize each type of writing task. Be warned! Do not copy or memorize the templates that I post here. You need to create you own. Do you agree or disagree with the following statement? “Nuclear power is a useful source of energy for the future.” Use specific reasons and examples to support your opinion. Introduction: Agree or disagree with statement. State three reasons why you agree or disagree. Countries are always looking for renewable sources of energy. Presently, most societies heavily depend on fossil fuels such as coal, oil, and natural gas. However, these types of fuels are limited, so eventually these resources will be depleted. In addition, fossil fuels, after they are consumed, release harmful pollution into the atmosphere. In fact, overwhelming evidence suggests that these energy sources are a principal cause of global warming. As a result, countries are searching for cleaner burning, more sustainable forms of energy. Some believe, in fact, that nuclear power will be a better choice of energy in our future. Nevertheless, I strongly disagree with any uses for nuclear power as a future energy source. This form of energy is vulnerable to natural disasters, human error accidents can happen in the nuclear reactors, and some countries can weaponize the uranium used for the energy to build harmful nuclear bombs. Therefore, this form of energy is harmful to our civilization. First of all, the nuclear reactors used to create nuclear power are vulnerable to natural disasters. For instance, a few years ago, Japan had a large earthquake near one of its nuclear facilities. Consequently, part of the nuclear reactor sustained cracks from the violent shaking. To complicate matters more, a gigantic tsunami hit the facility causing even more damage. As a result, the nuclear power plant suffered an explosive meltdown. Many radioactive elements were released into the air, the water, and the soil. In the aftermath of the disaster, a lot of land surrounding the facility is now contaminated with radioactivity. In addition, the ocean was also contaminated with radioactivity causing tremendous harm to the environment. The effects of this disaster were felt as far as California when radioactive water was detected near the beaches along the coastline. Second of all, nuclear power plants can have human-error accidents which have catastrophic effects. For instance, in 1986, a power plant in the former Soviet Union suffered a nuclear meltdown followed by a huge explosion. Many people working within and near the facility died. In addition, those who were exposed to the radiation in nearby communities developed cancer years later. In the city of Chernobyl, where the accident occurred, radiation continues to contaminate the water and soil thirty years after the incident. Most likely, no one will be allowed to live there for at least another 100 years. Lastly, operators of nuclear power plants can secretly weaponize their facilities by making nuclear bombs. Uranium and plutonium, both of which are naturally occurring radioactive elements found in the Earth’s crust, are needed in order to produce nuclear energy. However, the radioactive elements can also be used to build atomic bombs. The last thing our world needs right now is more nuclear bombs. Between Russia and the United States alone, more than 2,000 bombs exist. Currently, Iran claims to be using its uranium for peaceful purposes by producing nuclear power to generate electricity for its residents. However, many believe that Iran is actually weaponizing its uranium to build weapons of mass destruction. In conclusion, there are simply too many disadvantages of nuclear power. Natural disasters and human errors can compromise these energy-producing facilities. Countries can disguise their bombing making facilities as peaceful nuclear energy buildings so no one will know what they are up to. As a result, I strongly disagree that nuclear power is a viable future energy source. You are a boss working at a large company, and you need to hire a new worker. What are the advantages and disadvantages of hiring an older (40 years old+) or a younger worker (25 years+)? Use specific reasons and examples to support your answer. For any economy to thrive, jobs must be available for people. As a result, business executives form companies in order to manufacture goods to sell some type of service. People currently employed sometimes look for other job opportunities in order to advance their positions and salary. In other cases, students complete their undergraduate and graduate studies, after which they eagerly enter the job market. If I am a boss at a large company, of course, I will need to make many important decisions about hiring. Hiring and retaining employees is the single most valuable asset to any corporation. There are advantages and disadvantages if I choose to hire older or younger workers. In the first place, hiring older workers may benefit my company because these employees have 10-20 years of experience. Moreover, I will not need to spend money training them. For instance, if I hire an older worker as a sales associate, he/she will have already had a decade or more of sales experience. Most likely, this worker will begin to generate sales for our company immediately without a lot of necessary training. However, because many older workers have a lot of experience, I will have to pay them more than their younger counterparts. To illustrate, an older worker who already has 10-20 years of a sales experience is going to ask for a higher salary than a younger worker who is coming out of college with little or no sales experience. In the second place, younger workers may prove a boon to my company because they are clever with new technology. Many younger workers are familiar with social media platforms and are up-to-date with the latest computer and Internet technology. Therefore, for example, if I hire a younger computer programmer, I will most likely find that this worker can easily adapt to any new technology that s/he needs to learn. Conversely, younger workers are sometimes less loyal. They take a job with the intentions of using that job as a stepping stone for a higher paying job in the near future. For instance, my nephew, who is a 27 year old accountant, has already changed jobs three times in as many years, each time accepting a higher-paying job with more responsibility. In the final analysis, based on experience, pay, technological saviness, and loyalty, older and younger workers have advantages and disadvantages, which is why many companies end up hiring both types. The last common type of TOEFL independent writing prompt asks you make an argument and present several reasons why you believe the way you do. This prompt is less focused and more opened ended than the other two. However, it does NOT mean your response should be unfocused. You will need to make a choice and then explain the reasons for your choice. If you could choose any place to visit in the world, which location would you want to visit. Use specific reasons and examples to support your choice. The TOEFL Independent Writing Strategies are similar to what you already learned with the “Agree of disagree” type of writing prompt. Introduction: Make a choice. State three reasons for your choice. The world is full of many exciting destinations for tourists. Paris has its amazing Eiffel Tower, which brilliantly lights up the night sky. Cairo has the monumental ancient prymids, whose history go back 1000’s of years. New York City, or the Big Apple as it is so affectionately called, offers Times Square, a place that many like to visit to kick off the New Year. Undoubtedly, many exciting places exist worldwide that I would love to visit. If I had to pick one place to visit, I would visit San Diego, California. My friend Tomas who visited said that San Diego allures tourists through Old Town, pristine La Jolla Beach, and a year-round temperate climate. First, San Diego is a great place to visit because of a tourist attraction called Old Town San Diego, where the first Spanish settlement on the US West Coast is located. During Tomas’ visits at the old mission, he was richly educated on Old Town’s colorful past. In addition, part of the reason Tomas enjoyed his visit was the Mexican heritage atmosphere. For example, next to the mission, he ate at an authentic Mexican restaurant where the cooks made the tortillas by hand. The food was absolutely delicious, according to Tomas. I definitely to eat the food and to see the old mission. Second, in addition to Old Town, San Diego is famous for its pristine La Jolla Beach. One of the days Tomas was in San Diego he spent seven hours at the beach. His son and he went snorkeling in the clear blue water with towering sandstone cliffs all around. While they were in the water, they saw lobsters, blue snails, and several starfish. In addition, when they were not swimming, they built a giant sandcastle on the beach. Furthermore, they took an hour nap on the soft sand under the warmth of a bright sun. They still have fond memories of the time they spent at La Jolla. When I go to San Diego, I will also spend some time at the beach. To sum up, based on what my friend Tomas has told me about San Diego and based on what I read about the climate, this beautiful California beach city is one destination that I have added to my bucket list. 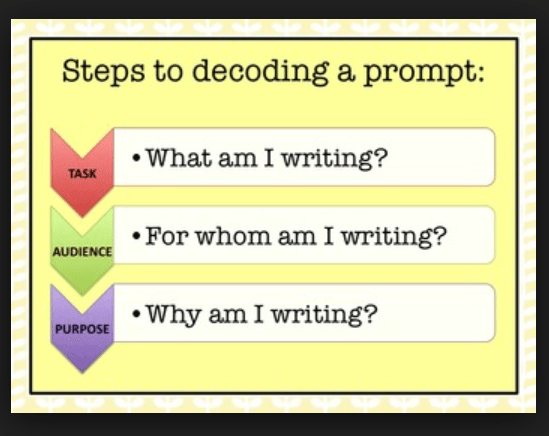 In addition to identifying the writing prompt, you should jot down some key points that you would like to write about. 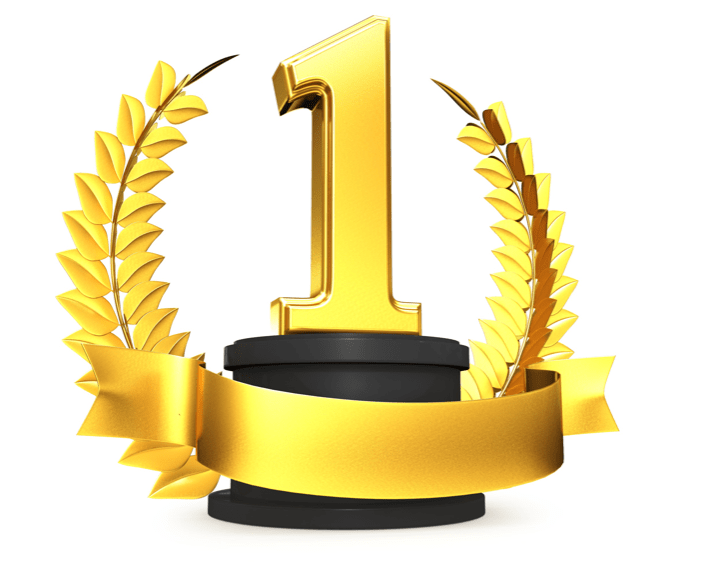 To get some general tips to master the TOEFL iBT, go here. You should not use more than 2-3 minutes to write down these key points. The key points you write down during you pre-writing will become topics for each of your body paragraphs. 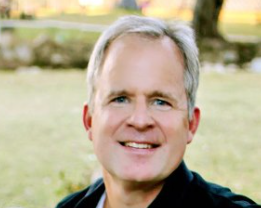 For example, based on the notes see you here, the writer focuses around easier access to higher education for locals, a more vibrant economy, and a safer community. This is why the writer believes that building a university in his hometown is a good idea. You just learned some important pre-writing TOEFL independent writing strategies. Your next step is to integrate these key ideas into a thesis. State whether you agree or disagree. Include specific reasons to support your argument. Restate the writing prompt but do NOT copy word for word. Instead use synonyms of the key words from the writing prompt. Example thesis statement: I agree that the construction of an educational institution would benefit my city. Having a university would make it easier for local residents to attend college, it would uplift our economy, and it would create a safer community. I have several reasons to support my point of view. There are several reasons to support my ideas. I will support this argument in the following paragraphs. In this essay, I will explain my point of view by using some personal examples. I will explain my opinion to support this point of view. I feel this way for two main reasons which I will explore in the following essay. Do not write a thesis that in any way resembles the examples that you just read. 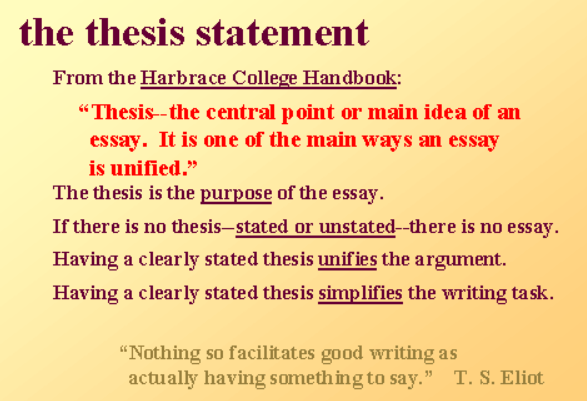 For other tips on writing focused thesis statements, read this post I wrote. Do NOT memorize any of the thesis statements I provide here. 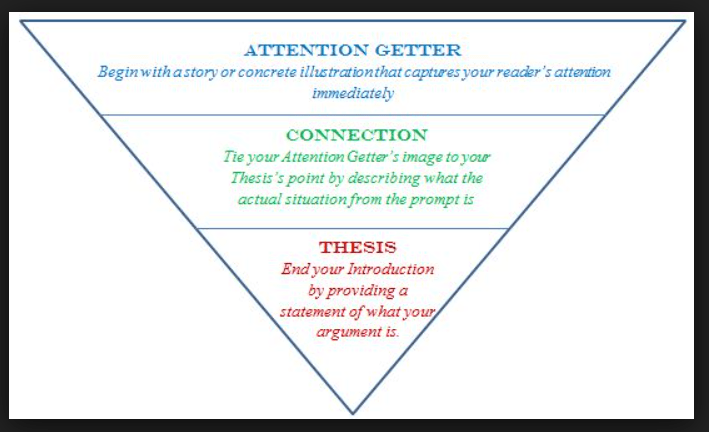 Rather, use them as guidelines as you practice framing your unique thesis statements. I agree that the construction of an educational institution would benefit my city. Having a university would make it easier for local residents to attend college, it would uplift our economy, and it would create a safer community. Building a university in my city has several important advantages: easier access to college, more thriving economy, and safer community. Therefore, I wholeheartedly agree with this statement. If city officials allow a university to be built in my hometown, more local residents will attend college, the economy will strengthen, and the city will have less crime. As a result, I agree with this statement. Having a university built in my city is something I can live with. Easier access for locals to attend college, a stronger economy, and a safer community will be direct benefits of this project. Building a university in my hometown will make it much easier for locals to attend college. In addition, the economy will benefit because of the new jobs. Finally, crime rates will decrease. Hence, I agree with this statement. All five thesis statements that you see here explain exactly the same idea. However, I use different grammatical sentences in each case. Notice how in the last example I used three separate sentences to express the key point of the thesis. 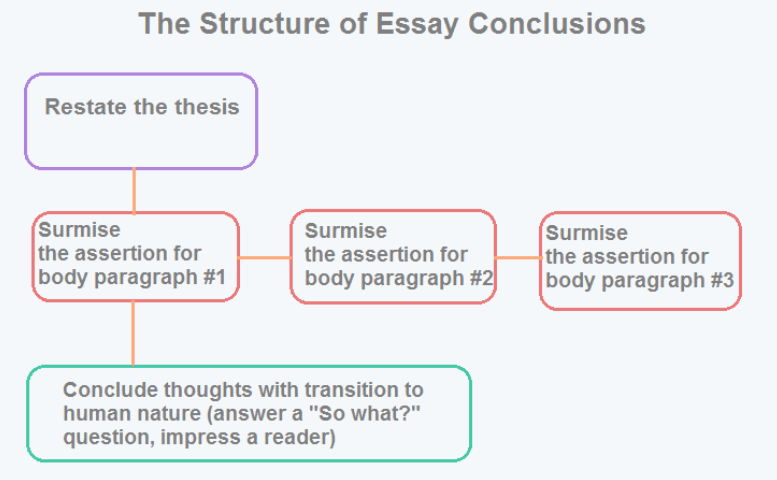 As you can see, there are many different ways to construct thesis statements. Make sure your thesis is grammatically correct. Your thesis should also forecast the specific points of your body paragraphs. Example introduction: Residents of any town want a city of which they can be proud. In many cases, these city dwellers will welcome the construction of any new facilities so long as these structures positively affect most members of their communities. What if a new university is proposed in my community? Some may object to the new facility because of increased traffic issues, whereas others are more than happy to have this new facility in their town. If city officials allow a university to be built in my hometown, more local residents will attend college, the economy will strengthen, and the city will have less crime. As a result, I agree with this statement. Example thesis statement: Building a university in my city has several important advantages: easier access to college, more thriving economy, and safer community. Therefore, I wholeheartedly agree with this statement. I support the idea of a university in my town because local residents will find it easier to attend school. Moreover, having a university in my town will have boosting effect on our local businesses. Finally, building a university in my hometown will lower our crime levels. Notice how each topic sentence restates one of the key points from the thesis. Did you notice that I did not use exactly the same words? You want to show the TOEFL iBT human raters that you have a wide range of vocabulary. Use this resource page to help you expand your vocabulary. As a result, do not be too repetitive. Use synonyms instead. Learn one simple trick right now for improving your topic sentences. If you include too many details in a 100 word paragraph, you will not have depth and progression of ideas. 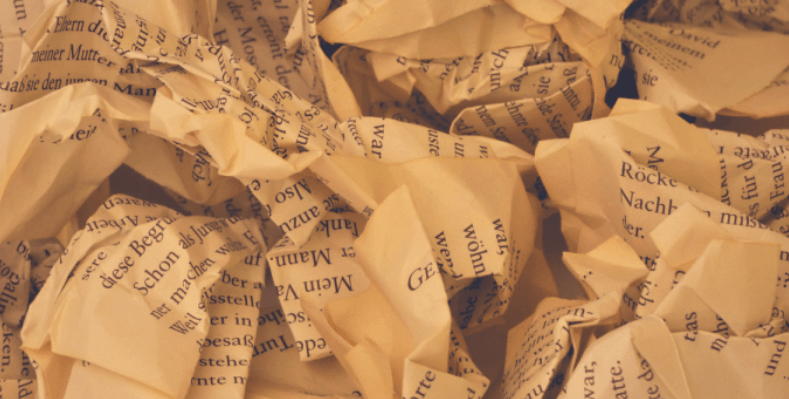 A writer who tries to say everything says nothing. Have you ever heard that quote before? Moreover, having a university in my town will have boosting effect on our local businesses. To illustrate, my friend who lives in Tupelo, Mississippi just had a university built in his hometown. After its completion, the university boasts a student enrollment of 15,000 students. In addition, more than 2,500 faculty and staff are employed at the new institution. As a result, a combined total of almost 20,000 new consumers buy food and other items in the town whenever a need arises. My friend told me that sales at his “Mr. Taco” Mexican restaurant have tripled since the university was built. In fact, my friend had to double his workforce and even expand the capacity of his restaurant due to all the additional business. Based on my friend’s example, I have to believe that similar things would happen if a university were built in my hometown. Did you notice after “to illustrate” that I spent about 105 words on one example. And guess what? Not a single part of that example was true. I made it up just so I could show you this paragraph. That is exactly what you want to do when you cannot think of any real life experiences. 3) Learn to be creative. Use longer sentences played against shorter sentences every now and then. Use a variety of simple, compound, complex, and compound/complex sentences. Use subject-verb inversion sentences everyone in a while. Use fronted past and present participles; use appositives in front of the subject. Use different kinds of subjects such as nouns, pronouns, noun clauses, gerunds, gerund phrases, infinitives, infinitive phrases, and adjectives. You should use a combination of long (20+ words), medium (15+ words) and short sentences (10+ words). Generally, use more longer sentences since readers can move through those quickly. Use a short sentence every one in while when you want to slow down readers to emphasize an important point. Example paragraph with mostly longer sentences: I support the idea of a university in my town because local residents will find it easier to attend school. Many of the residents in my town are poor. Therefore, they do not have enough money to study abroad in some area far from where they live. For example, my friend Tomas wants to attend college to become an electrical engineer, but he cannot afford to travel long distances to attend college. Tomas told me that he wants a university in his hometown. He has enough money to pay for tuition and books if he attends college, but he does not have enough money to travel to another college where he will have to pay for his room and board. Simple (Subject + verb): John went to the store to buy some bread. Compound (Subject + verb, conjunction + subject + verb): John went to the store to buy some bread, but he ended up purchasing milk, cheese, and cereal instead. Complex (Subject + verb + subordinating conjunction + subject + verb): John went to the store to buy some bread because he wanted to make some peanut butter and jelly (PB & J) sandwiches. Compound/complex (Subject + verb, conjunction, subordinating conjunction + subject + verb, subject + verb): John went to the store to buy some bread, but, when he arrived, he ended up purchasing milk, cheese, and cereal instead. There is no easy way to learn this. As you practice, you will develop a writing style that works for you. 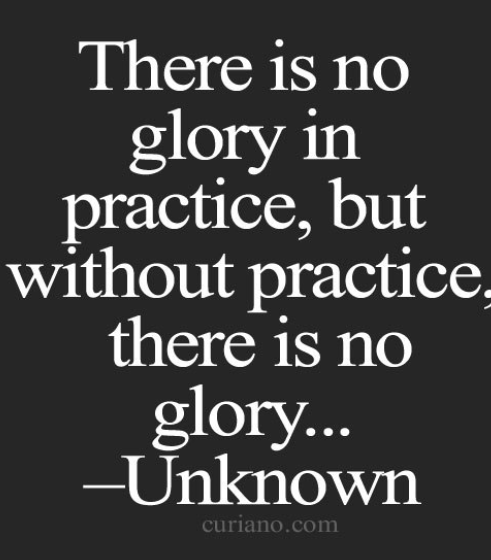 As you practice, try not to use use too many simple sentences. Using only simple sentences during the independent writing task will surely cause you to score lower. Example of paragraph with only simple sentences: Finally, building a university in my hometown will lower our crime levels. My town has a population of about 230,000 residents. It would have more revenue after the construction of a new university. There is a limited budget for security. Therefore, my town does not conduct enough police patrols at nights and on the weekends. These city officials are in charge of spending the taxes on services. We could use some of that new revenue from the new university to hire more police officers for our community. These new officers could become a larger presence in the especially troublesome neighborhoods. Therefore, crime could be significantly reduced in our city . Lacking syntactic variety, the above paragraph will score lower since it relies only on the simple sentence. Example of paragraph with sentence variety (simple, complex, and compound complex): Finally, building a university in my hometown will lower our crime levels. My town, which has a population of about 230,000 residents, would have more revenue after the construction of a new university. Currently, my town does not conduct enough police patrols at nights and on the weekends because there is a limited budget for security. City officials who are in charge of spending the taxes on services could use some of that new revenue from the new university to hire more police officers for our community, and these new officers could become a larger presence in the especially troublesome neighborhoods. Therefore, crime could be significantly reduced in our city . Unlike the paragraph with only simple sentences, the above paragraph uses simple, compound, and compound/complex sentences. 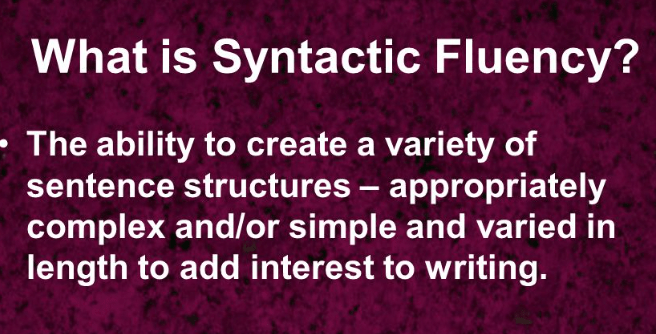 As a result, the paragraph displays syntactic variety, so it will score higher. 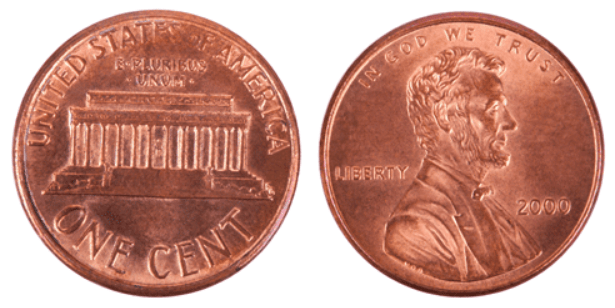 Appositives: A man of integrity and honor, Abraham Lincoln proved to be one of America’s greatest presidents. Fronted present participle: Having more money to invest on hiring new workers, businesses could be more productive. Fronted past participles: Located next to city hall, our town library has more than 3 million printed online texts in its facility. Prepositional phrases of location: Next to the San Bernardino lies the CSUSB campus. Question: Do you know how many people live in the world? As a general rule, you should place the subject in the beginning of your sentences. However, consider changing the word order in 1-2 sentences within each of your independent or integrated writing tasks. Do not overuse the grammar that you see here! Adjective: The poor need assistance from the government. Noun: The clover smells sweet. Pronoun: It is a new bookcase. Noun clause: What they found surprised me. Gerund: Swimming is good exercise. Gerund phrase: Working ten years in the mine was enough. Infinitive: To sleep in is a luxury. infinitive phrase: To be able to read is very important. The important point is to NOT overuse any one of these types of subjects. If you feel that you need to improve your knowledge of English grammar, use this resource web page to help you improve. 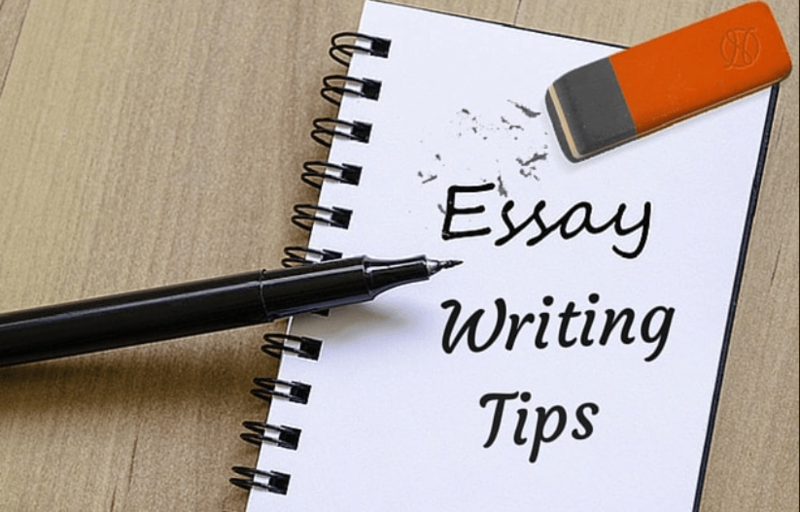 Making sure that you have clear connections of ideas within each paragraph will also help you to score high. Paragraph unity and cohesion will help you accomplish this. Each sentence must give more details relating to the topic. 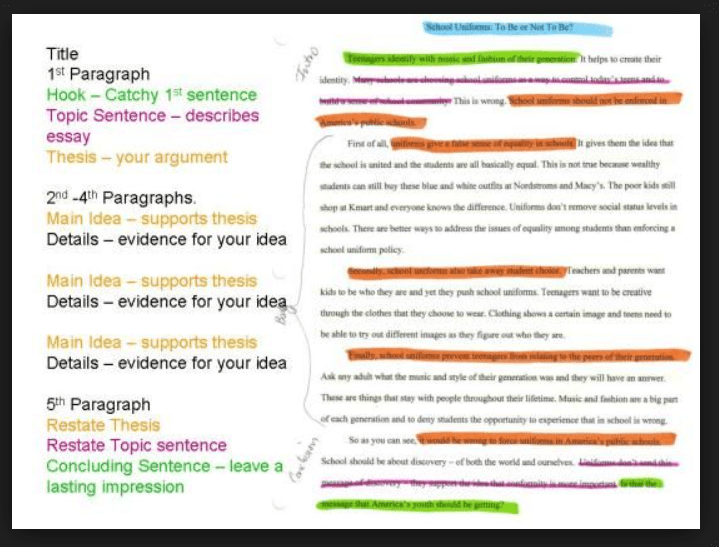 The ideas in your sentences must have the same focus as what you stated in the topic sentence. Without paragraph unity you have chaotic writing. Each sentence goes in whatever direction it likes. This is what TOEFL chaotic writing looks like! Example paragraph without unity: My friend Jacob attends a university in Oxford, Mississippi. His educational facility has about 12,000 students. I think the United States has about 3,000 universities nationwide. Some schools have older style buildings. Jacob told me that he liked studying in Oxford because of the quiet atmosphere. Universities have traffic from the students, and they drive all over town. I went to Cal State, San Benardino, which is located next to the beautiful San Bernardino mountains in Southern California. Other universities have new style structures and are pleasing to the eye. As result, many universities benefit the towns in which they are located. Example with paragraph unity: Having a university in my hometown will increase employment opportunities for local citizens. A university with an enrollment of 15,000 will require at least 2000-3000 professors and staff to teach the student body and to conduct daily operations. Staff such as groundskeepers and janitors, for example, will come from the local population. In addition, the student body, faculty, and staff will need places to live, eat, and shop. These needs will force my town to build new apartment complexes, restaurants, and shopping centers. As a result, my town will need construction workers, architects, managers, servers, and sales associates. All of these needs will create 100’s and maybe even 1000’s of new jobs, which will positively affect the economy, all resulting from having this new university built. 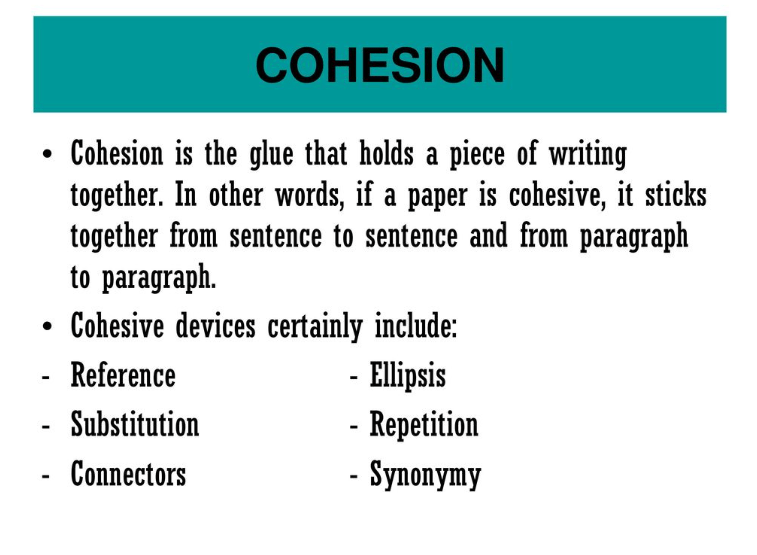 Cohesion helps to have sentence-to-sentence level connectedness. Thus, in addition to paragraph unity, you want to keep all sentences and paragraphs connected. 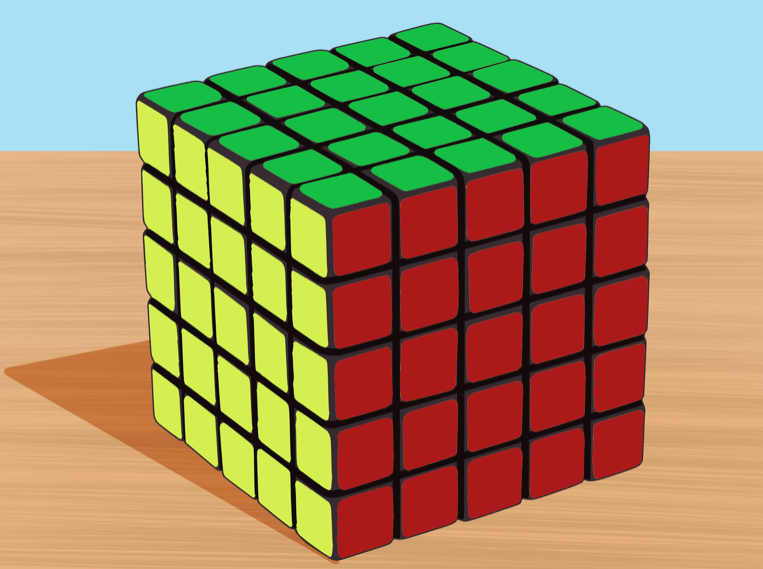 You can do this by using several different types of cohesive devices. 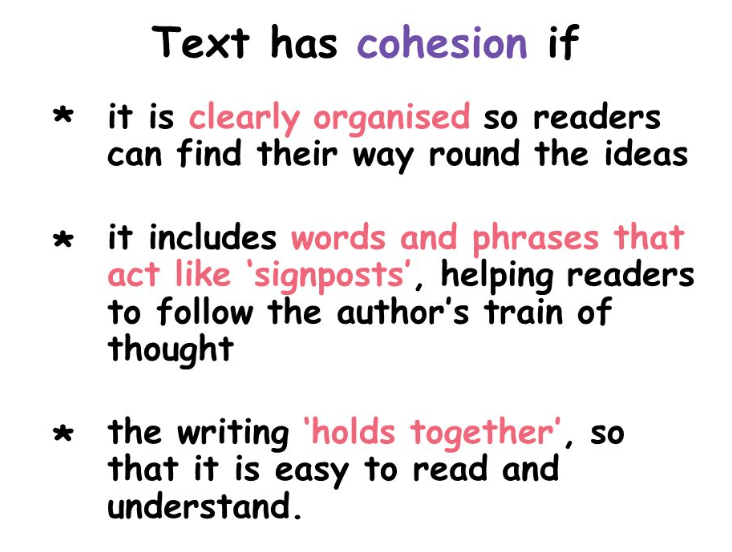 Transition words, many of which you can see here, help the reader understand the relationship of ideas within a text. Generally speaking, you should use approximately 4-5 transition words within each of your body paragraphs. See an example essay with numerous transition words. Read more. A good roommate will be respectful to me when we spend time together after school. Having this positive demeanor will help us to get along much better. In this sentence, “this positive demeanor” refers back to “respectful.” As a result, referring back to something previously mentioned can tie the sentences together more closely. When he shows respect, I will certainly treat my roommate with kindness in return. In this case, “he” refers to “roommate” which is mentioned later in the sentence. Consequently, using a pronoun to tie to something later in that sentence creates cohesion. The President indeed has the power to create executive orders or decrees without having to consent with Congress. The writer expects the audience to understand that “The President” refers to the President of the United States. In addition, the audience is expected to know that “Congress” refers to the legislative body of the House of Representatives and the Senate of the United States. Creating uniformity with verb tenses also helps to tie your sentences together. A favorite place I visited as a child was my grandmother’s house. Outside her cottage in the backyard, she used to have this swing in the middle of her grassy lawn that was surrounded by 10 tall Sycamore trees. One time, I remember being on the wooden swing when my father was pushing me. After about 10 pushes and when I was high in the air, I jumped from the swing and flew midair about 3 meters until I ended head first in the pool. Since it was a hot day, I refreshed myself in the cold water. Since the writer discusses a personal experience that happened in the past, readers expect to see past tense verbs which help the writer to tell this story. In addition, because the writer accurately and consistently uses past tense verbs, the paragraph ties together well. Being consistent with point of view also coheres sentences together within a paragraph. One important quality of a good roommate is cleanliness. Last year, when I attended California State University, San Bernardino I was lucky enough to have a roommate who always picked up after himself. For instance, after he took a shower every morning, he always put his toiletries under the sink when he was done. In addition, he made a point of cleaning the bathroom shower with sanitizing cleanser. He swept and mopped the floor with another cleaning agent. He even took time to clean the mirror and the sink. He kept our bathroom immaculate for six months. Similarly, not only did he always put his dirty dishes into the dishwasher, but he also deep cleaned the kitchen. Due to his cleanliness and neatness, my roommate and I got along great. The writer is consistent in the third person point of view, which you can learn more about here, (roommate, himself, he, his) and in the first person point of view (I). Had the writer first used the second person point of view (you), it would have eroded the consistency that you read in the paragraph. Substitution means replacing words or leaving words out for conciseness purposes. At that point, my roommate was completing his research paper. However, he wanted to go out to a dance club with this friends. But before he did that, he needed to finish. “Did that” replaces having to say “went to the dance club.” In addition, the writer uses “finish” instead of saying “finish his research paper.” Substituting or leaving out words is also helpful in connecting parts of a sentence(s). Parallelism refers to using several grammatically similar phrases within a sentence. In addition, parallelism involves several grammatically similar sentences within a paragraph. In either case, since the grammar is similar, readers will infer that the ideas are also similar within these phrases or sentences. Therefore, using parallel structures can effectively connect ideas together. Example paragraph with parallelism: Having a roommate who is quiet will make a much more compatible living space. These questions will illustrate why a quiet roommate is beneficial: Will I need to worry that my roommate will be watching the TV loudly all night long? Will I need to worry that my roommate will he loud and obnoxious late at night? Will I need to worry that my roommate will be talking loudly on his cell phone when I am trying to study? Finally, will I need to worry that my roommate will be loudly moving around the apartment late at night when I am trying to sleep? If my roommate is quiet, I will not need to worry about having any of these types of problems. As a result, having a quiet roommate is an important quality. In this paragraph, the writer uses several similar sounding interrogative sentences to emphasize why a quiet roommate is important. Somewhat similar to using “before” or “after” references to other words, repeating key words helps to unify ideas. Some effective TOEFL independent writing strategies involve repeating/rephrasing key terms from the writing prompt. 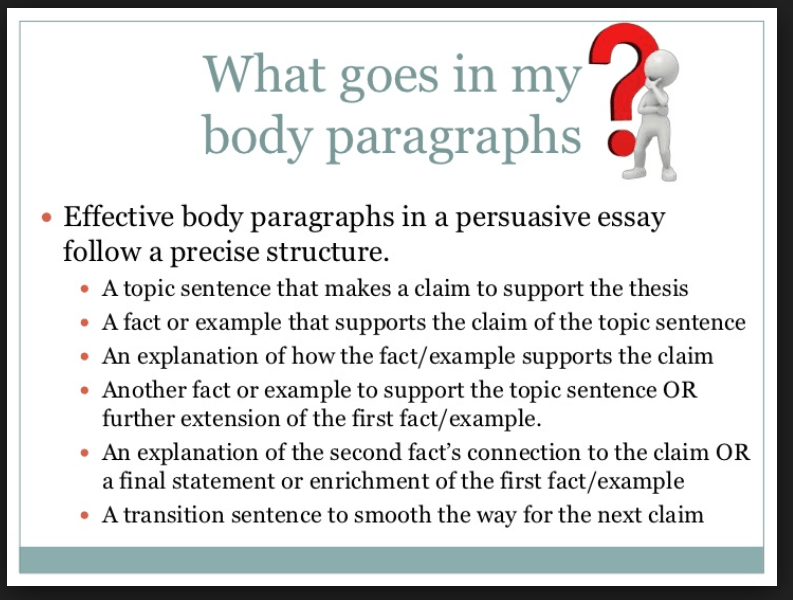 These repeated or rephrased key terms can be placed into the thesis and topic sentences of your body paragraphs. Example writing prompt: The automobile was invented more than 100 years ago. Shortly thereafter, the airplane was invented. Compare these two modes of transportation. Then explain which one has contributed more to the development of our civilization. Use specific reasons and examples to support your answer. Thesis which repeats key words from writing prompt: Though invented more than a century ago, automobiles and airplanes have innovatively changed local and more distant transportation patterns. Topic sentence which repeats/rephrases key points from the thesis: First of all, the automobile is a significant advancement to our society in that it has changed how we move around within cities and from cities to other cities. Topic sentence which repeats/rephrases key points from the thesis: Second of all, the airplane has developed our civilization by helping us travel far distances in a short period of time. Topic sentence which repeats/rephrases key points from the writing prompt: Personally, choosing between the two, I think the automobile has had a much greater impact on the development or our civilization. As you can see in the example thesis and topic sentences, “automobile,” “invented,” “100 years ago,” “airplane,” “transportation,” “development,” and “civilization” are either repeated or rephrased. The effect is that the introduction and body paragraphs are unified around the purposes of the writing prompt. Have you ever talked to someone on the phone when you were in a hurry? You know that you need to hang up, but you have to prepare the listener before you drop the call. In other words, you will need to pre-close the phone conversation before you end the call, right? Similar to a phone call, you need to “close” or conclude your essay. Include a transition word, more of which you can see here, to signal that the essay is coming to an end. 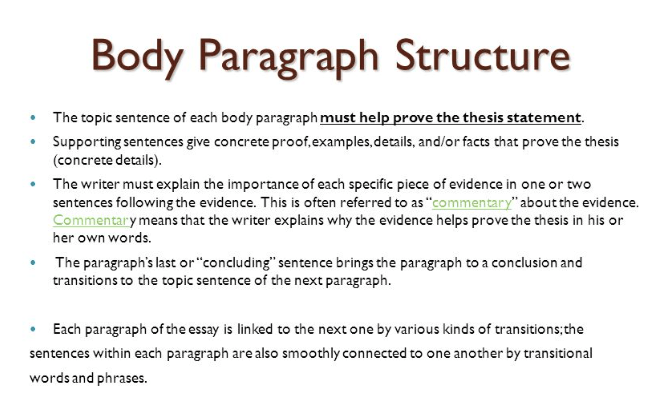 Restate the most important points in the thesis and body paragraphs. However, do not use the same words. Do NOT bring up any new ideas. Example conclusion: In conclusion, people undoubtedly want to live in harmony with their roommates while they are in college. Even though there are many important qualities that are important when choosing a roommate, being respectful, clean, and quiet are attributes that I look for. I will provide you TOEFL writing feedback to help you improve. If you have read most of this lesson, you know that I am serious about helping you to improve your writing score. In addition, you probably know that you will need to complete many practice TOEFL 1-2 tasks before you will make the improvements you need to score 24. You cannot learn how to write just by reading this TOEFL lesson or by watching You Tube videos. You MUST practice writing a lot. As you do your writing practice, I want to score your essays so that you can monitor your progress. For only $45 monthly, you can send me your writing practice tests. In fact, as one of my online students you can send me ONE independent or integrated writing practice test every 24 hours while you are subscribed to my course. These practice tests can come from anywhere on the Internet or from my Online TOEFL Course. By the way, the first week of using my services is free!